The Grind Wrestling Club, located in Alpharetta, Georgia, teaches the sport of wrestling to young athletes from age five through high school. In addition to teaching proper wrestling, strength, and conditioning technique, we teach important life skills. We instill work ethic, discipline, and character that our athletes carry with them throughout their lives. While many of our athletes will achieve great things in the sport of wrestling, we expect all of our athletes to achieve great things in journey of life. Our accomplished coaches teach the three major styles of wrestling which are Folkstyle, Freestyle, and Greco-Roman. Folkstyle, also known as "collegiate" wrestling, is an American form of wrestling found in high schools and colleges across the United States. Freestyle and Greco-Roman, collectively known as the "Olympic" styles, are found internationally (including in the Olympic Games). Frank Millsap is the owner of Grind Fitness and the head wrestling coach of The Grind Wrestling Club. Frank is an accomplished wrestler, mixed martial arts fighter, and fitness instructor. Through his successful wrestling and MMA careers, Frank has mastered Folkstyle wrestling, Olympic style wrestling, Muay Thai and Kickboxing. Frank has competed at the highest levels of wrestling across the United States. 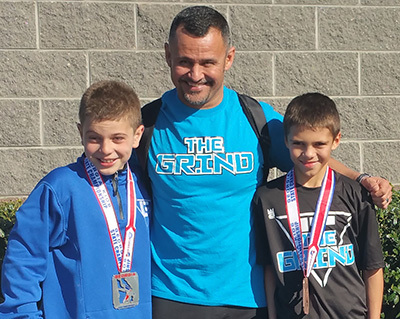 The Grind Wrestling Club is a year-round program that offers three distinct seasons. While many of our athletes participate in all three seasons, our multi-sport athletes may choose to participate only in the main Folkstyle season. We are supportive of athletes who pursue multiple sports and feel that wrestling only enhances an athlete's performance in other sports. The Folkstyle season is the primary and longest wrestling season of the year. This season starts with two months of training and preparation before the heart of the tournament and dual meet activity begins. The Folkstyle season concludes in March with the Georgia Kids State Wrestling Tournament followed by the Folkstyle Nationals. The Olympic season spans roughly three months and includes both Freestyle and Greco-Roman wrestling. During the Olympic season our athletes compete in Freestyle and Greco-Roman tournaments throughout Georgia and across the United States. While we focus on strength, conditioning, and agility throughout the year, we apply special focus on these disciplines during the summer months. The goal of our offseason training program is to prepare our athletes for tremendous success during the upcoming Folkstyle season. The Grind Wrestling Club welcomes wrestlers of all ages and experience levels. Prior to the commencement of the season, we meet with you and your wrestler to understand your wrestler’s goals for the season. One monthly semi private lesson is included in your Monthly Club Dues. Additional one-hour semi private or private lessons are available by request.